Reviewing the latest Pearl Jam album ‘Back Spacer’ turned out to be more challenging than I had expected. Having been exposed and become a fan of Pearl Jam at such a vulnerable time in my life (early teens.. YIKES!) there is a sentimental value attached to them which has most likely clouded my judgment when it comes to their music. The difficult part then was being able to make an assessment of the album without factoring in my respect and admiration, and without comparison to their first several albums, which hold a very special place in my heart. With that being said I’ve seen them grow and chance, sometimes for the better, other times for the worse.. Despite all this, I’ve never felt the desire to stop listening to them, or to not buy one of their albums. The loyalty must then be a reflection of the sincerity and trueness of their sound to whatever is going on in the world and in their lives at the time, an admirable quality . ‘Back Spacer’could be one of their best in several years. I say this for a few reasons. First off, the album is short and sweet. This is great in my opinion because it shows that they knew they had 38 really strong minutes of music they wanted to share with us and they kept it at that. No fillers, no fluff, just the good stuff. Some tracks such as ‘Supersonic’ have a heavy ‘No Code’ vibe, while some of the mellower songs resemble Eddie Vedder’s solo stuff. I’ve read interviews where they mention some new wave influences. To be honest I really didn’t pick up on that the several listens I’ve given it, but It may just be that subtle. Also, this is the first album in 13 years to have been produced by Brendan O’Brian. Clearly he understood the direction they wanted to take, because even though I haven’t found myself in love with any particular track, I can’t deny the overall cohesiveness and flow of it, which is pleasant to the ear. The lyrics have a calm and more positive feel that some of their older stuff, a big change, one it may take awhile to get used to, especially if their lyrics resonated with you because of their darkness. For once the guys (Eddie especially, since he wrote all the lyrics) must be feeling content with what’s going on in the world, politically (Thanks Obama) and in his personal life. The overall mood of the album is mellow with a twist of straight up rock. There is a pleasant balance between the two, and that may be why it’s such an easy listen start to finish. There is something I found Eddie Vedder doing with his voice in a few of the tracks which i’m not a big fan of. There is this sort of trembling and cracking that happens here and there, which seems completely intentional, but not flattering, I’d go as far as calling it distracting! Maybe he’s just getting old? I can’t say for sure. On the other hand one of the stand out tracks is “Unthought Known”, the song screams Pearl Jam, in a “Given To Fly” kind of way, it’s also just a really good catchy tune. 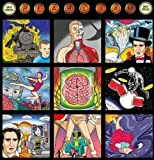 This is the least dark of their albums, that said, it doesn’t feel as though they made a conscious effort to keep it light, rather it’s as though the band has embraced who they have become and have adapted their sound to the times, and by doing so have produced a mature album that still sounds like Pearl Jam, minus the baggage. Cartoonist Dan Perkins can be thanked for the great album art, a very surreal series of vignettes depicting all sorts of random stuff, an astronaut playing drums? Overall, I’d say great listen, not my favorite Pearl Jam album, but considering this is their 9th, its safe to say these fella’s still know how to rock. And please do check them out live if you get a chance and haven’t seen em before, you won’t regret it!